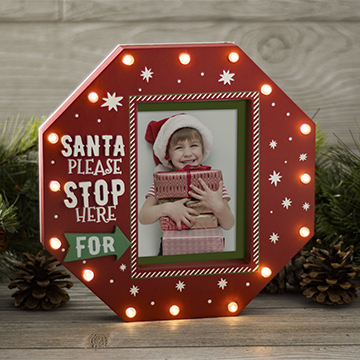 • Our Christmas Stop Sign photo frame features 3D text ‘’SANTA PLEASE STOP HERE FOR’’ with an arrow pointing to your photo. • Our photo frame holds either a 4" x 6" or 5" x 7" photo. • Just remove the included green mat to display your 5x7 picture. • Each frame is hand-painted with a snowflake border around the photo. • We include an easel back to display on your table or fireplace mantle. 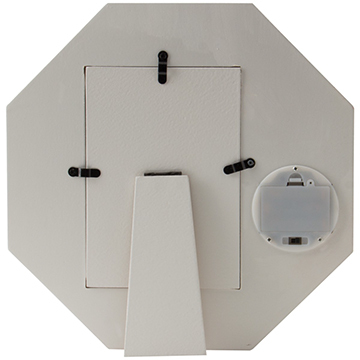 • Just engage a switch on back to reveal 16 LED bulbs around the border of the stop sign. • Stop Sign Santa Frame requires 3 AAA batteries that are NOT included.